Frequently Asked Florida Probate Questions | DeLoach, Hofstra & Cavonis, P.A. There are a wide variety of legal options and potential pitfalls when it comes to probate and trust administration. The experienced lawyers at DeLoach, Hofstra & Cavonis, P.A. have been offering guidance and preparing plans for individuals and families so they can protect their assets and leave a lasting legacy. Here, we address many common questions families ask, drawing on our combined 60 years of probate and trust service to Floridians. What Makes an Asset Go Through Probate Upon Death? Most people know that when they die, they want their assets to avoid the probate process. Most people do not even know what probate is, but they know they want to avoid it. But what is probate and, even more important, when do assets go through probate in Florida? Formal Administration: A typical "probate" process where the court appoints the personal representative (i.e., "executor") to settle the estate. Summary Administration: A shorter and more simple form of probate when assets are less than $75,000 and all of the decedent's bills are paid (among other matters). Disposition without Administration: Not really a probate, per se, but a simple way for a family member or other person to get paid for last funeral costs. Ancillary Administration: When the decedent was not a resident of Florida but owned real property here. We have more on the types of Florida probates here. Did not have a beneficiary designation upon death. Assets in the decedent's own, individual name would be just about anything - bank accounts, stocks, bonds, brokerage accounts, real property (i.e., land), and more. When someone dies with these assets, no matter what the value, the family/heirs will need to look to one of the processes above in order to take control of the asset. If someone had a life insurance policy, IRA, 401k, etc., that did not have a beneficiary designation, that asset would also be subject to the probate process. Mom dies with a bank account and her homestead property, both in her individual, individual name. The family/heirs will need to see a probate attorney to gain control of the bank account and to sell the home. Where are Probate Assets Distributed? Probate assets are distributed according to the decedent's last will and testament, if they have one, and if not, then according to the laws of intestacy. What Should I do to Avoid Probate? There are a number of ways to avoid probate with your own estate plan. If you want to learn more about how to avoid probate, please download a copy of my book, The Top 20 Rules to Protect Your Florida Estate. Do I need to hire an attorney to probate a Florida estate? Does probate have a small estate affidavit? Download our free book, Navigating the Florida Probate Process! Does Florida Have a Small Estate Affidavit Process? The general answer is no, or at least not in the way that is helpful to most families. We usually get this question when someone dies without a beneficiary of a life insurance policy, IRA or 401K. When the family is trying to claim these funds upon the death of a loved one, the financial company may send a claim form with a statement about a "small estate affidavit" that would be necessary in order for the family to receive the assets. Unfortunately, Florida does not have a small estate affidavit process, with one exception, which means the family will more than likely need to consult a probate attorney to help gain control of the assets. Mom died with a bank account of $3,000 in her own, individual name. The bank will not give the family access to this bank account. The decedent's son paid for mom's funeral expenses of $4,000 out of his own pocket. With the proper petition to the court, the court will order the bank to pay the $3,000 to the son to reimburse him for paying the funeral bill. Here is Pinellas County's petition. If the decedent had multiple assets and no one needs to be reimbursed for funeral expenses, then it is possible that the family can go through a Summary Administration. An attorney is likely helpful in this process due to the complexity - nothing is easy in the Florida probate process. The Summary Administration process is close to the small estate affidavit but it is not as easy as you would think. We frequently have families come to us for help after trying to do a Summary Administration without legal help. To learn more about the difference between the disposition without administration/summary administration, I have written more on the types of Probate in Florida that would be helpful if you cannot get control of an assets upon someone's death. This may or may not mean you need to hire an attorney upon the death of your loved one. If your loved one has passed and you are trying to access their assets, our free guide to Navigating the Florida Probate Process will be very helpful. This guide reviews the Florida probate process from start to finish. What Makes an Asset Go Through Probate in Florida? Do I need an attorney to probate an asset in Florida? Does Florida Have a Minimum Amount Needed for Probate? Disposition without Administration: This process is available some very small estates and technically does not involve the probate process. It does, however, involve the Florida Court system. It is available for someone who is seeking to get reimbursed a funeral bill or for medical expenses within 60 days of death. Here is a link to the Disposition without Administration process in the Pinellas County Clerk of Court's website. Example: Mom dies with $2,000 in a bank account in her own name. The bank will not let anyone access the funds and tells people they need to get "letters from the court." If someone paid for mom's funeral out of their own pocket, that person can go to the Clerk of Court where mom passed and get a court order directing the bank to pay them the $2,000. Summary Administration: This is a more simple probate process that is available only when: 1) the assets are worth less than $75,000; 2) all the heirs consent; 3) all bills are paid (a big issue with summary administrations; and 4) all of the decedent's assets are known. The family would still need to see an attorney for assistance but the process is generally cheaper and easier under most circumstances. Formal Probate Administration: This is the full probate process of appointing the personal representative, dealing with creditors, publishing in the newspaper, etc. This is done when assets exceed $75,000, the estate has debts, heirs do not agree, there are unknown assets, and more. If your loved one has recently passed and your family is looking to probate an asset, please download our free guide on Navigating the Florida Probate Process to learn more. Will I have to pay income taxes on my Florida Inheritance? If your loved one recently died, you may be concerned about probate, trust settlement and other issues. Among those includes tax issues - both estate taxes and income taxes. On income taxes, the receipt of an inheritance is not income to the beneficiary. Our income tax system is based solely upon working for your income. An inheritance is not something that you worked for, so the receipt of an inheritance is not taxed to you as income. One possible exception to this rule is the receipt of an IRA or an Annuity. Once monies are removed from an IRA or an annuity, there may be taxable consequences to the beneficiary as the assets have likely appreciated in value. The likely tax return that an heir should be concerned with is the estate tax, but an estate tax only applies if the decedent's estate is worth more than $11.20 million (2018). Most people do not need to worry about this as most estates, by far, are below level. If you want to learn more about probate and the probate process, feel free to download our Free Guide to Navigating the Florida Probate Process. How can I avoid probate court proceedings in Florida? Under Florida law, certain assets must go through probate court proceedings after an individual’s death. This is a way to keep track of all of the deceased person’s assets; pay any outstanding debts or taxes; and ensure that property is legally transferred to beneficiaries. The biggest drawbacks of the probate process are that it can take a long time for the beneficiaries to gain possession of assets due to a fairly cumbersome court process. It is our general opinion that good estate planning generally tries to avoid probate, although there are worse things than actually having assets go through probate. In our opinion, what is much worse than probate is having assets go to the wrong people or having heirs fight over assets upon your death. Compared to probate, having these two things happen can be much worse than the probate process! Probate Assets. These are assets in the decedent's own, individual name. These assets are distributed according to the decedent's will if they had one, and if not, then according to the laws of intestacy (i.e., the decedent's family) if no will existed. Joint tenancy property. Property that is owned jointly by the deceased and someone else may be passed directly to the surviving owner under a law called the right of survivorship. This can be a house that is owned by a couple, or a joint bank account with two named owners. In order to avoid probate, the survivor must have his or her name listed on the joint tenancy property and no other beneficiaries are on the title. Should you add your children to your property? Generally, the answer is a NO! Adding children as co-owners of your property is frequently a terrible idea. Before you add a child to your assets, including your home, speak with your estate planning attorney first. Beneficiary-designated accounts. Florida law allows residents to add a payable-on-death designation to checking accounts, savings accounts, retirement accounts, certificates of deposit, and life insurance policies. As long as the deceased person has designated a beneficiary, the money in the account may be transferred to the named person without probate. Florida also allows transfer-on-death designations on stocks and bonds, allowing beneficiaries to directly inherit brokerage accounts. Should I do this on all of my assets? Generally, this can be a mixed bag. With all of the assets jointly held, who is in charge of the funeral expenses? Who is in charge of the decedent's taxes? If nothing goes through probate and all of the assets are jointly held, no one is in charge, and this may create huge problems! Living trusts. In Florida, assets that are held in a living trust may pass to beneficiaries without probate court proceedings. These trusts must be created before your death, and all assets—including real estate, antiques, vehicles, and so on—must be transferred into the trust under the terms of the trust document. You'll remain trustee until your death, at which time your named successor will be control the assets in the trust. Enhanced Life Estate Deeds. Florida is one of the few states that allow enhanced life estate deeds, sometimes referred to as "Lady Bird deeds." These deeds allow residents to preserve their eligibility for Medicaid during their lifetimes while keeping valuable assets in the family. After death, the real property named in a Lady Bird deed pass automatically to beneficiaries without probate—meaning that assets cannot be taken by the state to recoup any Medicaid benefits used by the decedent. We use enhanced life estate deeds for simple estate matters and living trusts for more complicated matters. We will discuss the difference with you, of course. Some estates won't need to go through formal probate at all. If a deceased person doesn't leave behind any real estate, and his or her total assets don't exceed funeral expenses and other end-of-life costs, then probate isn't required. If a person leaves behind few assets, beneficiaries may be able to go through a shortened version of probate known as summary administration. If the holdings of the estate aren't eligible for either of these simpler method of administration, beneficiaries must go through formal probate. The key here is seeing a good probate attorney to direct you when the time comes. The best way to protect your holdings and provide for your family members is to create a Florida estate plan tailored to your specific needs. Contact us today to speak to a member of our legal team about your ideas for the future. What should I do first upon my loved one's death? While you may already be doing this, you should take care of important family matters such as planning the funeral, visitation, obituary, family communications and more. This is always the most important priority. You may also be dealing with the funeral home. At this time you will want them to help you obtain original death certificates for your loved one. We typically tell families to get four original short form death certificates and four original long form certificates. The short form death certificates do not have the cause of death – the long form death certificates are generally used with life insurance policies. If the assets are very simple or the estate very small, you may not need this many death certificates. It generally takes about 10 days to get the death certificates from the funeral home. Typically, the original death certificate is necessary to get legal and financial matters started. After you have the funeral and have obtained the death certificates, you can start with the financial aspects such as claiming life insurance policies, annuities, trust settlement and probate, when necessary. If you want to learn more about probate, what probate is, and other legal aspects, you may want to download a free copy of Navigating the Florida Probate Process, our book written by attorney D. "Rep" DeLoach, III. How Long Does the Probate Process Take in Florida? The Florida probate process takes a different amount of time based upon the type of probate. There are two types of probate in Florida: a formal probate administration and a summary probate administration. There is also a disposition without administration that is available in very limited circumstances. The formal probate administration usually takes 6-9 months under most circumstances. This process includes appointing a personal representative (i.e., the "executor"), a 90 days creditor's period that must run, payment of creditor's claims and more. One important distinction on probate is that the personal representative, once appointed by the courts, has the ability to manage and sell the estate assets. This means that while the probate process can take a number of months, the estate assets can be sold and managed effectively. The summary probate administration, usually reserve for small estates worth less than $75,000 that have no debt, can take less than a month under the right circumstances. If your loved one died with assets in their own, individual name, then they will likely need to seek an attorney to deal with the court process. If you want to learn more about the Florida Probate process, please download our free book on Navigating the Florida Probate Process. Does a Last Will and Testament Avoid Probate in Florida? Having a last will and testament in Florida does not ensure that your assets avoid probate upon your death. A last will and testament distributes your probate assets to the correct beneficiaries. Your probate assets are assets that you own in your own, individual name. Your last will and testament tells the Florida probate court where these assets are distributed upon your death. These probate assets are distributed under the rules of the Florida Probate Code, which generally means you need to hire an attorney to assist your heirs with the process. Mom has a falling out with her daughter and wants to disinherit her. Mother changes her last will and testament with her attorney so that daughter is disinherited. Mother does not change the beneficiary of her individual retirement account (IRA) which still names the daughter as a beneficiary. Upon mother's death, while her probate estate may not go to her daughter, the IRA will. The reason is that the last will and testament did not effect the IRA beneficiary designation. If you want to learn more about estate planning or probate avoidance, please sign up and attend one of our monthly free estate planning seminars. We also have more information on estate planning and other elder law topics in our legal library. 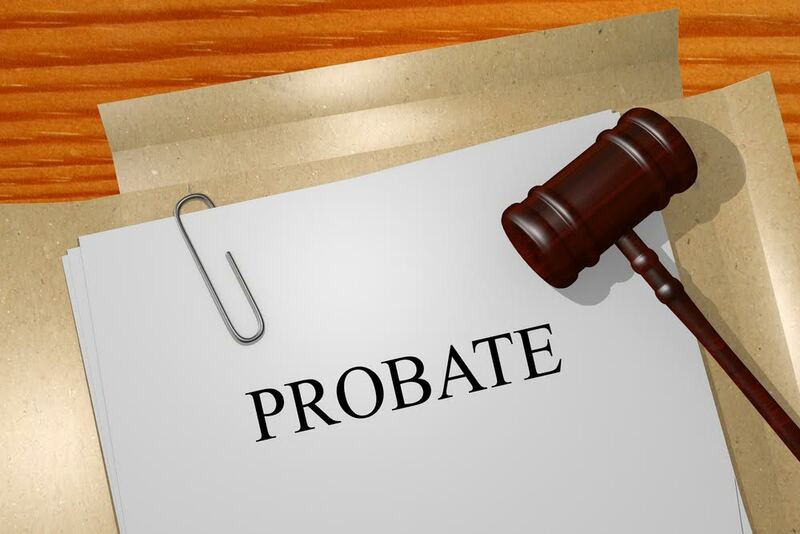 Probate is the legal process of settling the estate of a deceased person and, more specifically, distributing the decedent's probate property to the rightful heirs. The probate process generally involves assets in the decedent’s probate estate, which includes only those assets in the decedent’s own, individual name. The probate process does not generally include assets that are jointly held with rights of survivorship and other assets distributed by contract such as life insurance, IRAs and 401Ks. These are distributed to the survivor or to the designated beneficiary without the estate’s involvement. In our example, the probate process only includes the rental property and the stocks because these are the only assets that are owned by the “probate estate.” This means that the heirs must hire an attorney to assist only with these two assets. The bank account would now be owned by the daughter as the survivor and the IRA is distributed directly to the daughter as well, avoiding the probate process and, ultimately, avoiding attorneys. Make sure the decedent’s affairs are properly settled. Most people would agree that the probate process itself has good goals. Most believe, for instance, that a decedent’s creditors should get paid before their heirs receive their money. As the probate process is a legal process, an attorney will need to be hired to help go to court to properly follow the correct procedure.